Since having extensions in my hair I’m finding that I have to spend a little bit longer actually taking care of it. Gone are the days where I can just wash it every other day and leave it to it’s own devices. It’s a bitter sweet kind of deal now, as even though my hair does look super awesome with the extensions in, I’m finding that I have to actually blow dry it and use more styling products just to keep it ship shape for a longer amount of time. I’ve attached my hair extensions using micro loop rings, which was incredibly easy do just do myself once I got the hang of it! It was definitely a case of practise takes perfect to get them just right and a lot of the tutorials online were conflicting opinion on the ‘correct’ way to attach them. I’ve got there in the end though. 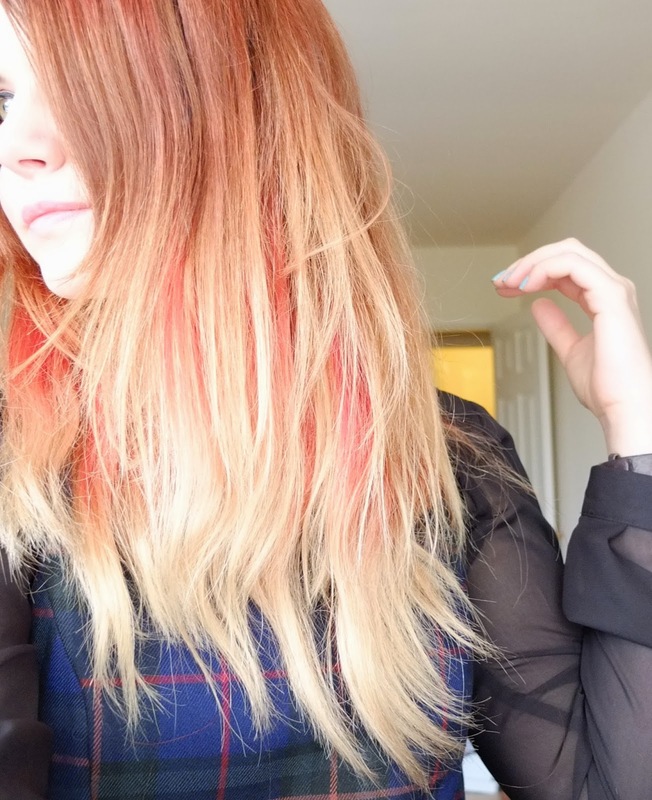 I have used a combination of my dip dye extensions I blogged about a while ago and some blond I&K clip in’s from hairtrade. Both sets are in wefts which I thought would be better to avoid that horrid ‘separated’ look that you see when Z List celebrities have them in. It’s also taken a bit of trial and error to find out what works and what doesn’t work too with my new found long locks! For shampoo I’m keeping it pretty basic and just using a keratin based one so I don’t have to straighten my hair (because straighteners are the death of hair in general) and it’s working well. I’m only tending to wash my hair twice a week now instead of every other day as it’s such a ball ache to dry. 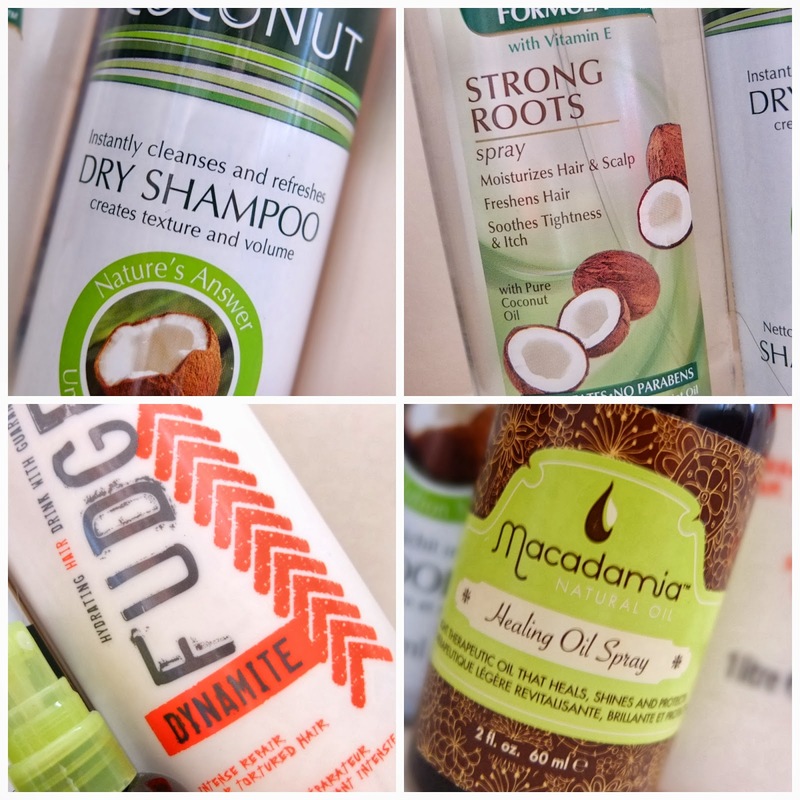 In between washes I’m using the Inecto Coconut Dry Shampoo which you can read about (here). It’s the most tantilising scent of toasted marshmallows with a hint of creamy coconut. It’s a right treat for the nostrils. My own hair dries a lot faster than the extensions it seems, but to counteract this I’m using the Macadamia Healing Oil Spray and Oil from the same range in intervals just on the extensions as this helps hair to dry a bit faster, but if I use the oil every time it does get a little heavy feeling. Both also help me to brush out the tangles a lot easier anyway! As I’m also trying to get my hair to grow (it’s been 3 years and stayed the exact same length) so I picked up this Palmers Coconut Formula Oil Strong Roots Spray. 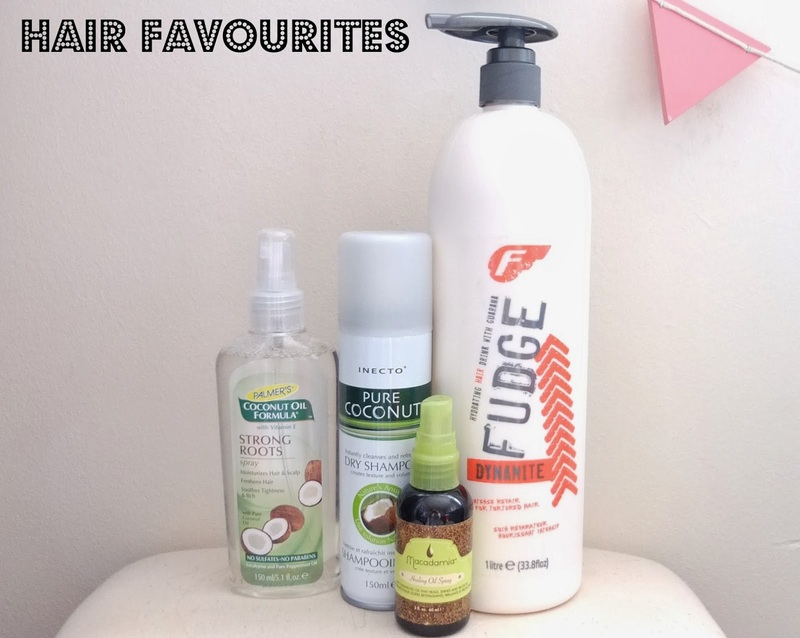 This range does seem to be formulated towards afro Caribbean hair types predominantly, but after falling in love with the Dark & Lovely cholesterol mask I thought this would be worth a whirl too! Things like this are only good on your hair if it’s heavily processed and extremely dry, if its not you will definitely find them way too heavy. I did think that the spray would make my hair really greasy looking as it’s oil based, but it doesn’t! Just don’t get over zealous with it and rub it in to your scalp and not only does it help to moisturiser your HEAD but also smells delicious, like minty coconut, so brilliant as a hair fragrance in between washes too and soothes the itch I keep getting around where my extensions are attached. If you have fine or grease prone hair I would probably avoid a product like this though to be honest. Once a week I will give my *actual* hair a treat with the Fudge Dynamite Rebuild conditioner which smells delicious too! There’s a constant scent party in my hair lately I tell thee. This is surprisingly not as heavy as one would assume, but I try to strategically get it just on the lengths of my real hair that need the treatment rather than my roots or my extensions. Leave it in for a few minutes in the shower then rinse it out and boom! You’re done! It almost makes my hair appear in as good a condition as the fake hair too, haha. And here is my hair in all it’s glory. I’ve snipped through the ends to make it look more ‘natural’ but I do need to bite the bullet and pull my finger out to dye it properly at some point. For now I’m happy with it though. I’m attempting to make the slightly imperfect and erratic colour look work if anyone asks, it’s totally going to be the next big trend, honest.